There are many reasons mothers express their breastmilk. Mothers may express for their sick or premature baby, to build their milk supply, because they are going back to work, or just for the reassurance of having some milk in the freezer. Whatever your reason, the last thing you need is for it to be a challenge. Many mothers who are new to expressing end up in a panic, when after expressing for a while, they only have a little bit of milk. More often than not, it isn’t a reflection of the mother’s milk supply – babies do a much better job of it, and we don’t get to see it going in! So if you’d like to improve your pumping know-how, you’ve found the right place. Here are 5 tips to get you pumping like a pro. Many women who think they aren’t very good at expressing are surprised to find out that they’re actually doing really well! Don’t be fooled by the measurements on a bottle or instructions on the formula tin – the amount of milk you can express will probably seem quite small in comparison. Around 20-50mls in between breastfeeds is typical. You will probably find the volume is higher in the morning, lower in the evening and sometimes there isn’t much coming out at all. Remember, you are making a meal from the leftovers, not grabbing a ready-made meal from the freezer! Those women who brag about getting 150mls when they pump? You would too if you were achieving way above average! But if you can’t express a drop, don’t panic. Sometimes you just won’t be able to fool your body into thinking that the pump is your baby. Over time, you can help your body to relax and let-down the milk. There are things you can do to help. If you are just collecting a little milk here and there – just in case – a good quality hand pump or a good hand expressing technique will be all you need. 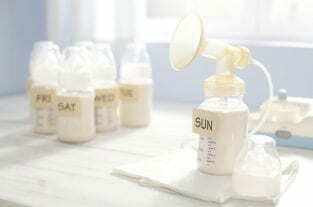 When you are partly feeding your baby expressed breastmilk on a short or long term basis, a personal electric breast pump will help you get the job done. If you are fully or mostly feeding your baby with EBM (expressed breast milk), consider investing in a hospital-grade rental pump or a more effective personal electric pump. A good pump with a double collection kit will make the most of your milk supply and decrease the time you spend pumping. A technique known as ‘hands-on pumping’ has been shown to improve the amount of milk collected when pumping. Your baby uses a complex combination of positive and negative pressure to remove milk from your breasts. A breast pump uses only negative pressure and hand expressing, only positive. Put the two together and you get closer to how a baby does it. These can double the amount of milk you can get! Find out more about maximising milk production with hands on pumping. #4: It’s A Piggy Bank, Not A Credit Card! In the early days of breastfeeding, the way you produce milk is like a credit card without a limit. When you express, you will probably get a fair bit of milk and you can get used to having all that “spare cash” anytime you need it! After a few weeks though, everything changes and you need to plan ahead for extra milk feeds in the freezer. Where you might have easily pumped enough milk for a feed in one session, now you need to collect smaller amounts over several sessions. You haven’t run out of milk, it’s just regulated to meet your baby’s needs! So now, little and often is the way to go – like collecting spare change in your piggy bank! But if you really need more in a hurry – power pumping can help. Research has shown that breastfed babies don’t drink as much as we used to think. In fact, the old calculation for how much EBM per feed was based more on what we knew about formula than breastmilk. It turns out that the amount per day doesn’t increase as your baby grows – well, at least in the age group studied, between 1 and 6 months. An exclusively breastfed baby takes an average of around 750–800ml in a 24-hour period (though the range is less than 500 ml to 1000+ ml). So working out exactly how much EBM you need per feed is a bit of trial and error. You can get a rough estimate using that 750-800ml average and divide it by the typical number of feeds your baby has each day. E.g. 10 feeds work out at about 75-80ml each. It makes sense to store your milk in small amounts. Rather than bags or bottles each holding 100mls, try breastmilk storage trays which only hold 30mls per block. You can then combine two or three and gradually work out the average amount that is right for your baby. This also means that you can thaw frozen milk as needed, without having to depressingly throw out breastmilk – it’s truly worth crying over! Learn more about feeding babies EBM here. Whether your baby is fully breastfed, mixed feeding or exclusively fed your expressed breastmilk, knowing how to make the most of your milk when pumping is useful. Find out more: 4 Fascinating Facts About Your Breastmilk. Looking for a top breast pump? 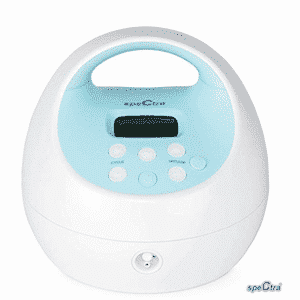 Spectra has become the popular choice for mothers world wide. Find out more information and prices on the Spectra here. Kent JC, Leon MR, Cregan MD, Ramsay DT, Doherty DA, Hartmann PE 2006, Volume and Frequency of Breastfeedings and Fat Content of Breastmilk Throughout the Day. Pediatrics 117:(3)e387-e395. Accessed here. Hi im from the philippines, i love all your articles it really helped me a lot in dealing with my pregnancy and now that i have my baby already. I always follow your tips and advice which really worked well in dealing with my baby. By the way, I would like to order breast pump because i badly need it since i will continue my studies, my baby is just 2 months old and as much as possible i don’t like her to be fed in any other milk. Im in the Philippines, please let me know the process, your help is really much appreciated. More blessing to come!!! Dawn, if your question is about what brand of breastpump to get, Medela have very good pumps. My milk supply is so low how can I re lactate ? Thank you for the valuable article. I’m a working mother and during my 8hours work period I can express around 300ml. That amount is adequate for the baby for next day. He is 4.2 months now and I got my periods back during that week I found my supply was very low and not even a half I could express. Is there a way that I can maintain my supply during periods?